Lieutenant Commander Eric Rolfs applies the lessons learned from Bartlesville, Oklahoma, to become one of the most elite surface warriors. Rolfs says some of the lessons he learned from his family and from playing sports in Bartlesville helped him to see the respect that people have for each other. He says Bartlesville is a friendly place, and that he took that with me into the military. 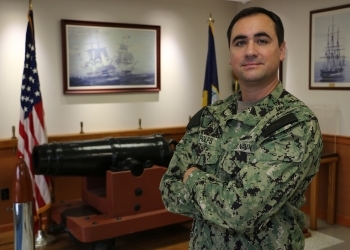 Those lessons, along with training and application learned during Rolfs’s 14 years of naval service, turned into an opportunity to teach the most innovative tactics of surface warfare at Surface Warfare Officers School, located in Newport, Rhode Island. Rolfs is a 2000 graduate of Bartlesville High School and a 2004 graduate of the United States Naval Academy. There are many sacrifices and goals one must achieve to be selected as an instructor, and Rolfs is most proud of the successful deployments carrying out the nation's mission. Rolfs is continuing a family tradition of military service. Both of his grandfathers served during World War II and he had an uncle who enlisted in the Air Force and retired as a lieutenant colonel. As Rolfs and other instructors train future surface warriors, they take pride in what it means to serve their country in the United States Navy.